After months of planning, developing, taste-tasting and much support from family, friends and popcorn lovers everywhere, the streets of New York will never quite be the same. Brooklyn Popcorn, newly launched, is taking New Yorkers by storm – street by street, borough by borough. The world’s first “Gourmet Popcorn Truck on Wheels” features mouth-watering, delicious popcorn that is popped fresh daily and has flavors that will have you sneaking away from the office, just to catch a whiff of that mesmerizing popcorn aroma. Ahhh! Started by a group of friends, with an insane addiction to popcorn and a desire to kick popcorn flavors up to the next level, Brooklyn Popcorn delivers buttery, sweet, tangy flavors that feature some of your all-time favorites - like Caramel, White Cheddar and Plain - as well as new and exciting flavors like Dill Pickle and Ketchup. Yes, Ketchup! Ready to dive into your own bag? A new state-of-the-art GPS system has been installed in our truck, so you can find us at anytime you have that craving for something warm and tantalizing. 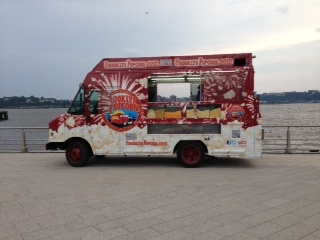 Just log on to www.brooklynpopcorn.com and click on: Locate our truck. Or if you’re on Twitter and Facebook, be sure to follow us and “Like” us to get updates on happening events, tasty specials and all popcorn-related news. Our Twitter feed will also update you on where the truck will be and offer some cool “Tweet” savings! Not in the New York area? Simply order your own stash from our website. We guarantee that all popcorn is popped fresh - the very same day it is shipped - for the absolute freshest, most premium-tasting gourmet popcorn on the planet. And be sure to send us your #PopcornLoveMoments. We just love seeing how all that warm, delectable goodness melts your heart and fills your belly. Send us your cool pics and even your ideas for new flavors! Who knows, we may feature a flavor you’ve come up with! Better yet, we just may post your picture on our Facebook page so the whole world can see that you were “Caught Eating Brooklyn Popcorn”! See you soon! Read Tweet » 1147 days ago. Read Tweet » 1148 days ago. Read Tweet » 1149 days ago. Read Tweet » 1150 days ago. Read Tweet » 1151 days ago. Read Tweet » 1152 days ago. Read Tweet » 1153 days ago. Read Tweet » 1154 days ago. Read Tweet » 1155 days ago. Read Tweet » 1156 days ago. Read Tweet » 1157 days ago. © 2014 Brooklyn Popcorn. All rights reserved.